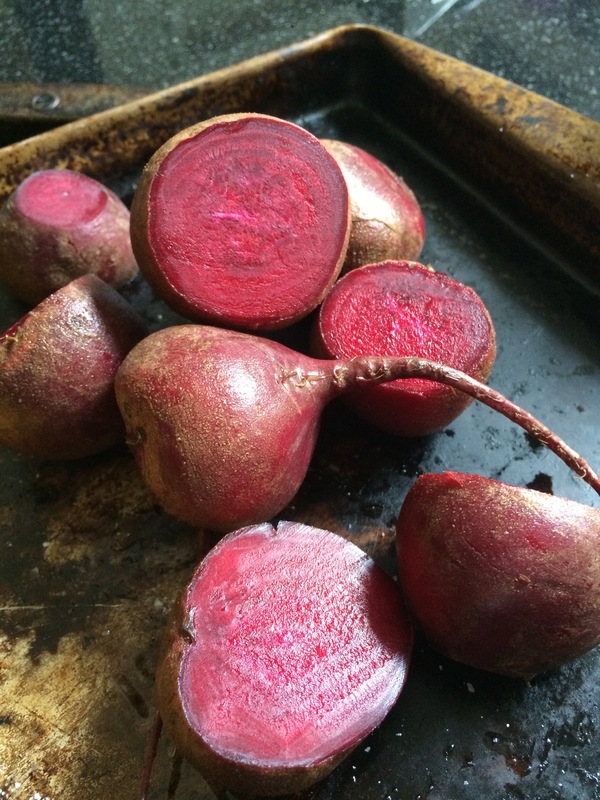 Beautiful roasted beets. The secret to success is preparation. This week started off with a stressful bang. While trying to make plans to meet a friend between presentations at a trade show, she remarked that the website listed my presentations on Tuesday. Great, except they were supposed to be on Wednesday. Yikes! I worked on them all weekend, but they weren’t done yet. I was also booked with another client for an all day meeting that people were flying in for on Tuesday. I am the ultimate multi-tasker, but being in two places at once is not in my repertoire. A marathon ensued, and a mere 15 hours later, I had two presentations loaded onto my computer. All that’s left was trying to figure out what I was going to say, and I’d be good to go. My other client was extremely forgiving. I hope that they are still a client next season. It’s 11pm. Do you know where your presentation is? Getting home from work at midnight usually entails indulging in my favorite comfort food dinner of popcorn and red wine. Hello Whole 30! No corn, no butter and no wine. Somehow decaf tea and berries with cashews didn’t provide me with any great comfort or pleasure, but it was a far better choice nutritionally. I am however, quite proud of myself for not caving. My energy level has been extremely high, which really helped me cope with the week. Late to bed and early to rise, I crammed for my presentations and somehow pulled them off. My stress level was off the Richter scale, yet something odd happened. Throughout the entire ordeal, I had an inner sense of calm, although I was completely stressed out. I was nervous about pulling together the content, an then about getting up in front of a room full of professionals and not knowing what I was talking about, yet the butterflies and tension were fully under control. Is it possible that my healthy diet left me well nourished, moderately well rested (less tossing and turning, and no burning stomach) and therefore more able to deal with the pressure? Is it possible that the junk I consume is what wears me down, and not the stress itself? I certainly don’t want to go through this again anytime soon to find out, but it is food for thought. Literally. 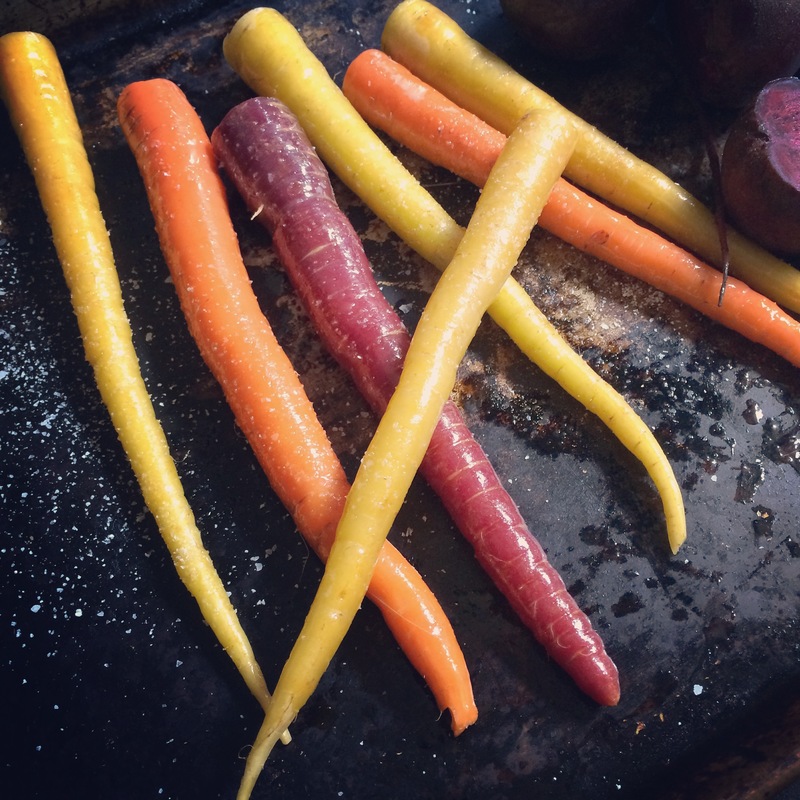 How could anyone prefer fake colored processed junk to gorgeous rainbow carrots? Wednesday brought a huge sigh of relief, as the tension of the previous weeks started to leave my body. I had a work related cocktail party where I happily sipped sparkling water with lime and avoided the hors d’ouerves. Since I got home late, I ordered a Mediterranean Salad without cheese for dinner. It arrived with double cheese which I tried to surgically remove. Feta cheese is soft and clings to everything, so getting rid of it wasn’t easy. If I ended up ingesting a microscopic piece of it, life will have to go on anyways. I had an all day seminar on Thursday, so I had some poached eggs and cherry tomatoes for breakfast, and brought a banana and a little glob of almond butter in a jar, “just in case.” I was happy to see that banana, since there wasn’t anything else I could eat. Even the vegan options were carb heavy. When I got home at 3:30 I gorged on cashews. Not the best example of Whole 30 eating, but sometime a girls gotta do what a girls gotta do! A business dinner wrapped up the crazy week! Although there was a prix fixe menu, I was able to navigate it. The appetizers, served family style were all off limits, but thanks to my nut binge, I was able to hold off. I dissected a burata and tomato canape, eating only the tomato part, to appear social. While almost everyone at the long community table opted for pasta, I had the chicken breast, which was simply grilled with a few vegetables and a drizzle of flavorful pesto that didn’t have any cheese in it. It was wonderful, and I doggy bagged half of it for lunch the next day. Score! It became joke, since only one person at a table of trend forecasters and fashion experts stepped out of the norm. Rather than make a fuss about my diet, I simply declared that pasta was over and chicken was the next big thing. Comic relief and a delicious, compliant dinner to boot! When dessert rolled around, there was some fresh berry thing in a deep bowl, so I asked for mine without the sauce or pastry. Nobody noticed that my little bowl contained anything different from theirs, so again, I was able to skirt the diet issue and stay on course. Next week is looking like it will be a calm one, so I may stay on track for awhile until a reason to go off presents itself. The next phase is re-entry, where each food group is added back individually to see what makes you feel unwell. I am dreading that little journey of self discovery, but it should be interesting. There is no re-entry for alchohol or sugar, since it presumed that everyone feels bad when partaking in them. Today is day 29 of 30. 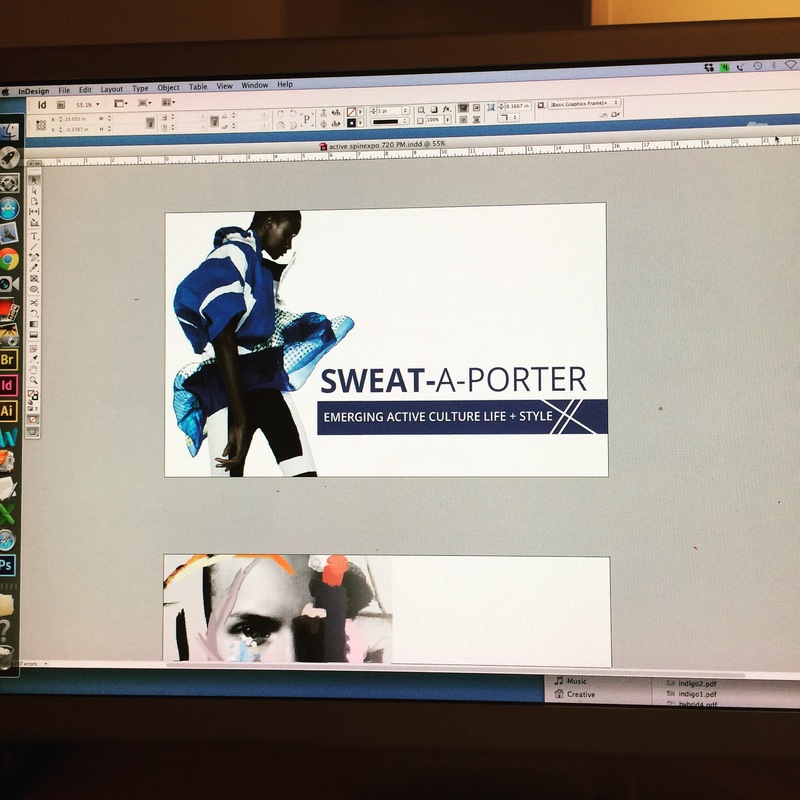 Stay tuned….I am almost done!